Bring life to your office, business or home with beautiful art from ARTEWOODS. This wood mounted giclee print is stylish, attractive and suitable for any contemporary and modern decor. This artwork is framed on solid wooden stretcher bars, with hooks mounted on frame back for hang. on top of the fireplace or just on an empty wall. Purchased iterms will be dispatched out within 3-4 days by post office and it takes 1~2 weeks to arrive to your door. We promise great quality at the most affordable price. This product comes with a 30 day money back guarantee after receipt. Each panel is individually wrapped and the entire package is double boxed for safe delivery to your home or office. We always do our best to provide an accurate description and realistic pictures. But colors may appear slightly different to each user due to individual monitors. Once there is any problem, please contact us directly, we will help you within 24 hours. 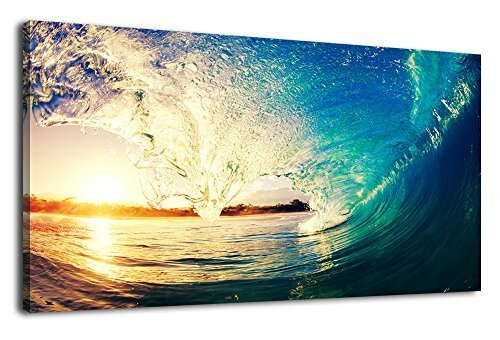 PERFECT Panoramic CANVAS ART: good idea for home decor such as living room, bedroom, kitchen, bathroom, guest room, office and others. EASY TO HANG: each canvas artwork already stretched on solid wooden frames, gallery wrapped, with hooks and accessories, ready to hang. EASE OF MAINTENANCE: high quality, HD prints on premium canvas, waterproof, UV resistant, fading resistant indoor. WORRY FREE AFTER-SALE: fast shipping, risk free for purchase, 30 days money back guarantee of reciept of shipment. Canvas Artwork Size: 20" x 40" ( 50cm x 100cm). If you have any questions about this product by arteWOODS, contact us by completing and submitting the form below. If you are looking for a specif part number, please include it with your message.